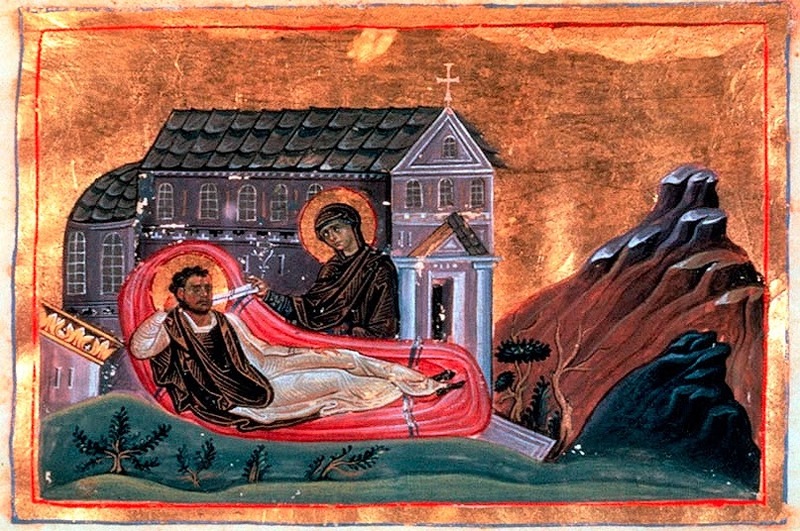 Saint Romanos the Melodist lived in the sixth, or according to others the eighth, century. He was ordained a Deacon in Beirut and then went to Constantinople, where he served in the Sacred Church of the Theotokos in Kyros, but participated in all-night vigils which were often done in the Sacred Church of the Panagia of Blachernae. He constantly supplicated the Panagia for the gift to compose hymns, because he really wanted to do this work but was unable. During the overnight service on the eve of Christmas, at the moment when the Canons of the feast are read, he fell asleep for a bit and saw the Panagia in his dream who, after greeting him, gave him a scroll of paper and told him to eat it. When he woke up he felt great sweetness in his mouth and unspeakable joy, because he realized he was given the gift to compose hymns. Therefore, full of divine inspiration, he began to recite the Kontakion which he composed at that moment for the feast of Christmas, the well-known "Today the Virgin". He served with zeal the work of hymnography and mainly composed Kontakia. The Kontakion of every feast is read before the Synaxarion. First, Saint Romanos, as indeed all the Saints, was a lover of services. That is, he loved to participate in the services of the Church, both during the day and at night, and primarily the Divine Liturgy, which is the center of all the Mysteries, since all the Mysteries take place in order for us to participate in the Divine Eucharist. At Mount Athos, as well as many other Orthodox Monasteries, the Divine Liturgy is performed daily and all-night services take place often, especially during celebrations and great feasts. The readings, hymns and general atmosphere created with the performance of Sacred Services, and especially during the Divine Liturgy, creates devoutness and a prayerful mood. Analogous to each ones receptivity, the Grace of God acts in their existence, resulting in the pacification of the heart, which repels sadness and despair within and showers us with divine consolation. "The consolation from hymns produces a state of soul that is cheerful and free of sorrow" (Basil the Great). "An Orthodox Christian must necessarily attend church, to participate in the Divine Liturgy by following the priest and chanters, and to pray especially at the time when the officiator says: 'Thine own of Thine own'. At that moment the heavens open and the Holy Spirit comes and changes the bread and wine into the Body and Blood of Christ. It is the most important moment of the Divine Liturgy. Also, when the priest emerges holding the Holy Things, during the so-called Great Entrance, and he commemorates the living and dead, we should also pray at that moment.... By going to church we receive the strength to continue our struggle during the new week. Just as the body has need for rest, so also the soul needs to renew her strength. This renewal can only be found near God. How can we nurture our soul if we don't go to church?" Second, Saint Romanos, as we saw above, received by means of a dream the gift of hymnography. "A dream," according to Saint John of Sinai, the author of The Ladder, "is a movement of the mind while the body is at rest." Dreams sent from God were seen by other Saints, but in accordance with the teachings of the Orthodox Church we must not believe in dreams, because the devil, by means of dreams, led many people into delusion and danger, since many times he transforms himself into "an angel of light", in order to deceive, if possible, even the elect. Saint John Climacus stresses that "he who believes in dreams is like a person running after his own shadow and trying to catch it." Saints have the ability to discern, according to their spiritual experience, when a dream comes from God and when it comes from the devil, but they still do not give importance to dreams, but they leave it to the judgement of illumined spiritual fathers and ask their opinion for their confirmation. When one is humble they are not willing to accept their dreams come from God, because they believe they are unworthy of this, and no matter what they seek the advice of their spiritual father. But there are also dreams which, according to Basil the Great, are associated with the cares of the day, and he therefore advises: "Let not night herself be all, as it were, the special and peculiar property of sleep. Let not half your life be useless through the senselessness of slumber. Divide the time of night between sleep and prayer. Yes, let your slumbers be themselves experiences in piety; for it is only natural that our sleeping dreams should be for the most part echoes of the anxieties of the day. As have been our conduct and pursuits, so will inevitably be our dreams." Participation in the worship of the Church draws the soul to uncreated Divine Grace, which empowers the believer in their daily struggle; and obedience to a spiritual father, moreover, shields us from error. Source: Ekklesiastiki Paremvasi, "Ρωμανός ο Μελωδός Ο ποιητής των Κοντακίων", October 2009. Translated by John Sanidopoulos.